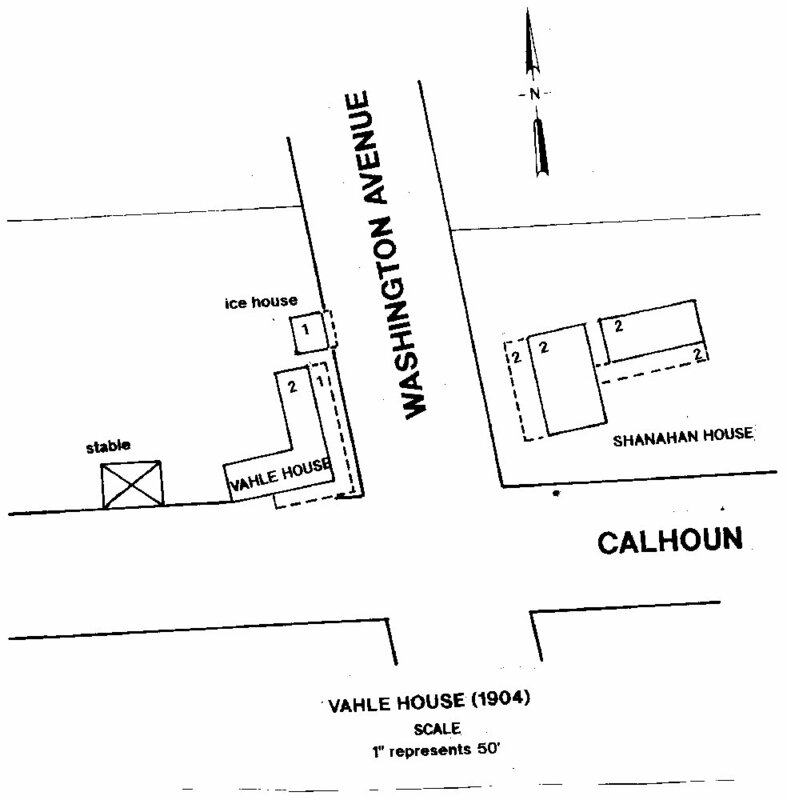 The Vahle House was located on the northwest corner of Washington Avenue and Calhoun in Lot 17 of Block 34 of the Culmseig Map (1854) of Ocean Springs. This boarding house was directly across the street from the Shanahan House. The Vahle House was a wood frame, L-shaped, two-story structure with 2156 square feet of living area. There was a seven-foot wide wrap around gallery on the first floor which faced east and south. Additional buildings on the lot were a stable of 432 square feet to the rear, and a small ice house of only 180 square feet just north of the hotel facing Washington Avenue. Courtesy of John Sterry Nill (1928-2002) -Austin, Texas. After the untimely death of Thomas A. Friar, the result of typhoid fever, on November 10, 1896 at Pensacola, his widow, Theresa Vahle Friar (1871-1956) inherited the Washington Avenue property. Thomas Adolph Friar left two children: Lydia Louise Friar (1895-1968) and Adolph C. Friar (1897-1971). After the Friar Cottage was destroyed by fire in March 1900, it was rebuilt from materials salvaged from the Old Methodist Church on Porter Avenue. Theresa Vahle Friar's, brother-in-law, druggist Herman Nill (1863-1904), who was married to Caroline Vahle (1862-1949) bought the old sanctuary from the Methodists in April 1900. The new structure resurrected from the ashes of the Friar Cottage became known as the Vahle House probably during the summer of 1900. 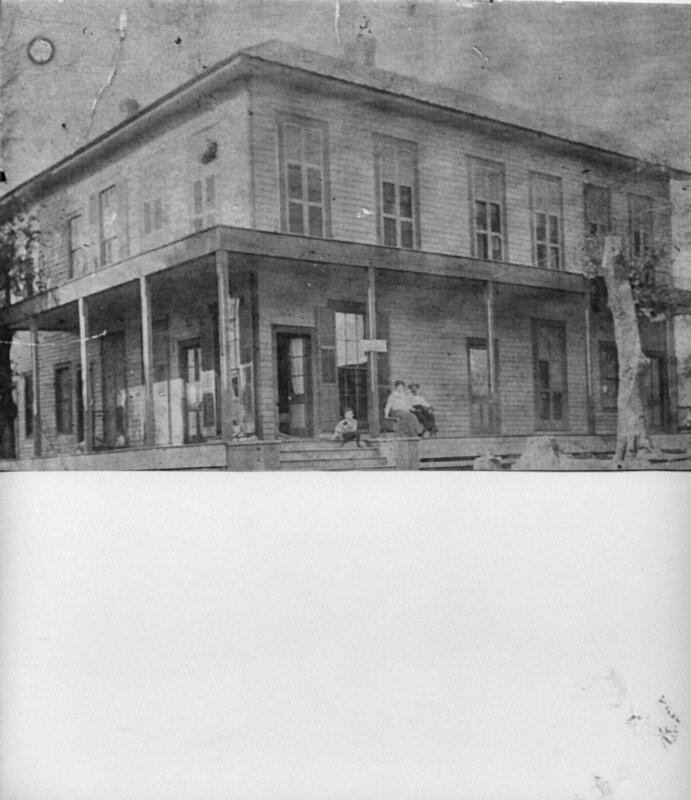 It was definitely in operation as a public house by the summer of 1901 as Katherine Vahle told ThePascagoula Democrat-Star that she was "making extensive interior improvements to her hotel". Theresa Friar's mother, Katherine Vahle (1838-1914) may have run the Vahle House as she is listed as a hotel proprietor in the 1900 US Census. The Vahles, of German extraction, came to Ocean Springs from New Orleans circa 1890. Her son, Casper Vahle (1869-1922), was a local entrepreneur involved in the livery business and hotels. He owned Vahle's Livery (1892), the White House in 1900, and had a lease on the Artesian House from Ann Morris in October 1899. (JXCO, Ms. Land deed Bk. 20, pp. 639-640) Daughter, Caroline (1862-1949), was married to druggist, Herman Nill (1863-1904), while Theresa was involved in the sea food industry as an oyster dealer. Some of the Vahle children spoke German. Caspar Vahle assisted his mother and sister at the Vahle House as exhibited by a note in The Progress of May 14, 1904: The Vahle House is receiving a new coat of paint by its owner Theresa Friar. Casper Vahle is superintending the job. The Vahle House was more than a boarding house. In 1904, it also housed D. Watts who tested eyes, filled eye glass prescriptions, made jewelry and watches. Watts may have been from St. Louis originally. One could purchase ice a few feet from the building where James Soden and Casper Vahle had an ice house just north of the structure. The heroic work of the Ocean Springs Fire Company No. 1, the Hook and Ladder Company, and citizen volunteers saved at least two blocks of residences on Washington Avenue. Although it caught fire in eight different places during the holocaust, the Shanahan House directly across the street from the Vahle House was also saved. Its loss would also result from a fire in 1919. Several years after the fire, Theresa Friar moved to St. Leo, Florida to be with her daughter Lydia, and son-in-law, William James Hewson (1876-1930). The Hewson children, William J. Hewson (1917-2007) and Mary Hewson (1919-2009), both joined religious orders of the Roman Catholic Church. William was ordained a priest in May 1940 at the St. Louis Cathedral of New Orleans, and said his first solemn High Mass at St. Alphonsus in June 1940. Mary Hewson became a nun adopting the name Sister Mary William. Both resided in Louisiana. Father Hewson expired at Baton Rouge, Louisiana on August 5, 2007 and Sister Hewson died at Opelousas, lLuisiana on July 3, 2009. The "Little Green House" was demolished in 1968. Where the Vahle House once stood is now a vacant lot which is part of the St. Alphonsus Catholic School playground. Ironically, the former site of the Shanahan Hotel across the street is now the Little Childrens' Park. 1. Jackson County Deed Book 17, p. 577. Charle L. Dyer, Along the Gulf, "Ocean Springs" (originally published by the L&N Railroad in 1895). C.E. Schmidt, Volunteer Fire Companies of Ocean Springs, Mississippi, "The Big Fire", (1960). The Daily Herald, "Caspar Vahle Dies", July 24, 1922, p. 4. The Jackson County Times, "Fierce Fire Does Heavy Damage", November 18, 1916, p. 1. The Jackson County Times, "Father Hewson says First Solemn High Mass in Local Church", June 1, 1940, p. 1. The Pascagoula Democrat-Star, "Ocean Springs Locals", March 30, 1900. The Pascagoula Democrat-Star, "Ocean Springs Locals", April 27, 1900. The Pascagoula Democrat-Star, "Ocean Springs Locals", May 11, 1900. The Pascagoula Democrat-Star, "Ocean Springs Locals", August 30, 1901. The Pascagoula Democrat-Star, "Ocean Springs Locals", February 1904. Sanborn Map Company (New York) "Ocean Springs, Mississippi", (1904)-Sheet 2. US Census - Jackson County, Mississippi (1900, 1910, and 1920).